It had been a soggy night in the Black Mountains. The rain had poured, pit pat, on Clark Tent non-stop. But I had been safe and warm inside nonetheless. I awoke hungry and headed towards Treats, a local cafe/shop, to see if there was any chance of breakfast. I was in luck – scrambled eggs it was. And Sue, the woman who runs Treats, was kind enough to pack me on my way with a huge slab of Apple cake too. The weather forecast wasn’t great; showers all day long were promised. 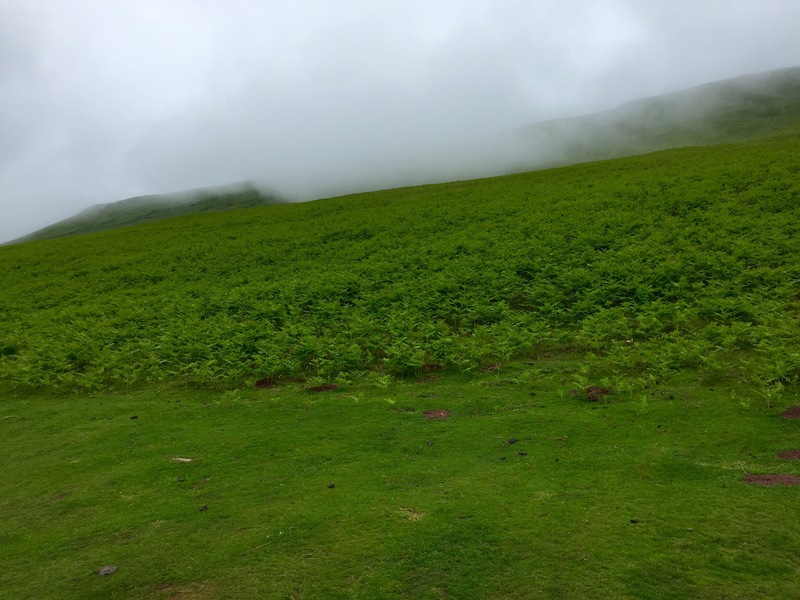 Hatterall Ridge was shrouded in low level cloud. 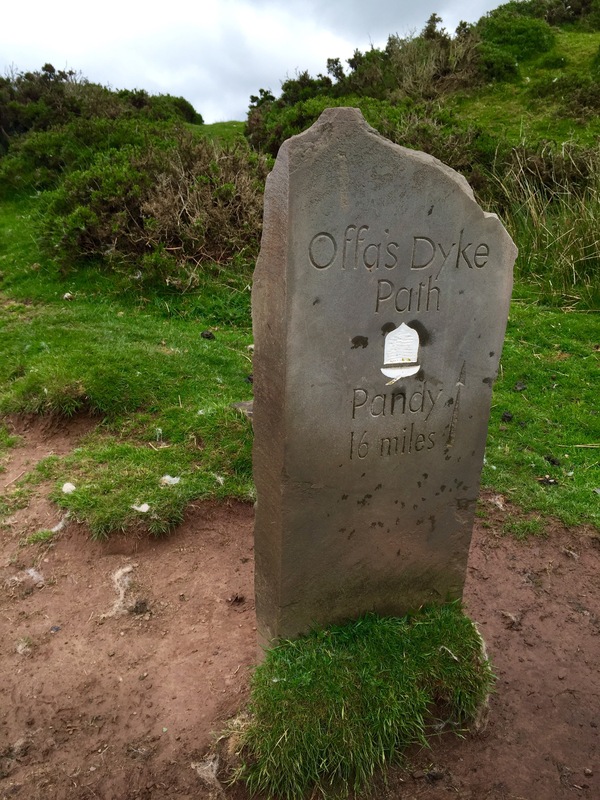 The Offa’s Dyke Path goes across the Ridge for several miles. But with such bad weather and poor visibility, I made the decision to take the road route via Capel y Ffin to Hay. When hiking or backpacking alone, the only person you can rely on is yourself and you’d be mad to put yourself at risk if there’s a sensible alternative. A mile out of Llanthony, the rain started. In Welsh we say that “it’s raining old women with sticks”. I’ve always loved that idiom. Out came the waterproofs and on went the rain cover on my pack. I continued walking. I didn’t think of much. I just concentrated on the rhythm of walking. I saw nobody on foot, just people passing by in cars. I had no signal and I couldn’t take my phone out for photos as it was too wet. Besides, there’s only so many photos you can take of rainy pastures and sodden sheep. 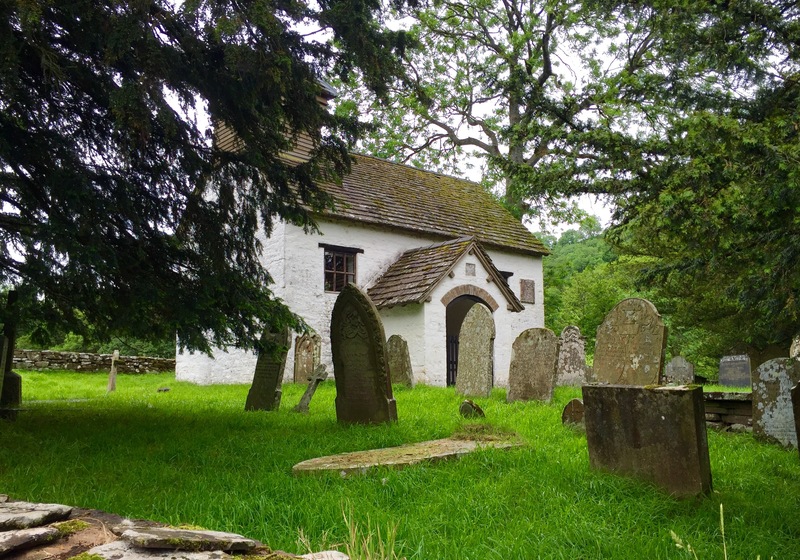 In about four miles I came to Capel y Ffin (which means chapel of the border), which is a tiny village consisting of a church and couple of houses. The rain started coming down in blankets. At the same time a yappy Jack Russell dog ran out of the nearby house and started barking at my feet. In such a situation, what do you do? 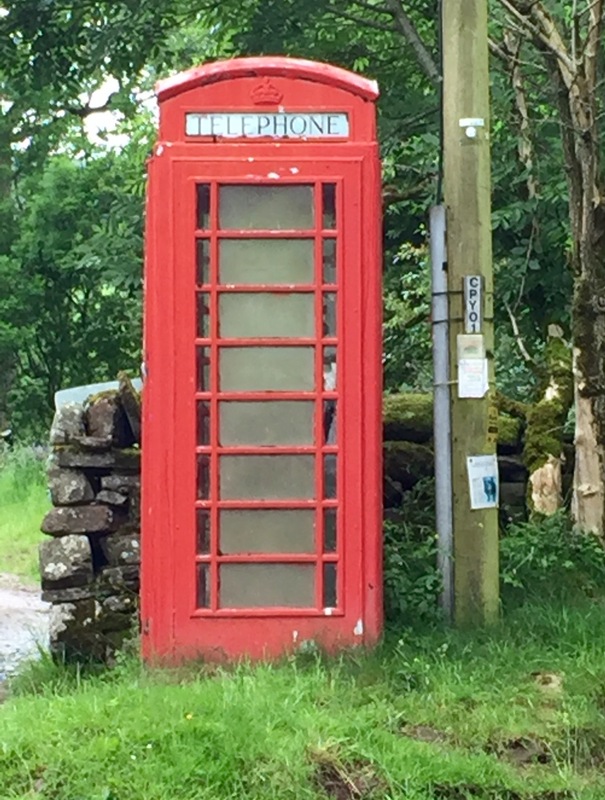 My sanctuary was an old school red phonebox. The box had plenty of inhabitants but I was the only human to have been inside it in some time by the looks. The owners came out to grab the ill-tempered little dog. There was silence. 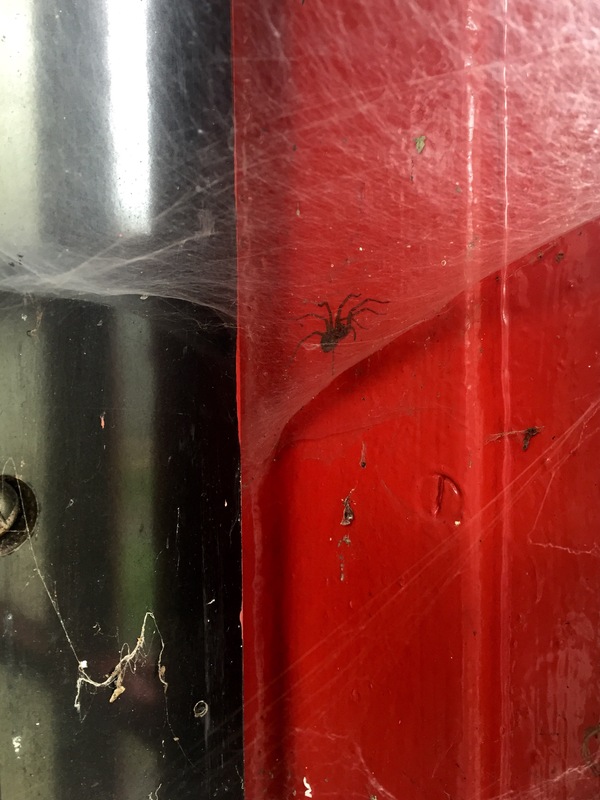 I tried to remember the last time I’d been inside a red phonebox. I couldn’t. In a few minutes, I started on my path again. About a mile out of Capel y Ffin, I sat down at the side of the road to eat the apple cake Sue had given me. I had walked about five miles or so and figured I had another six to go, or thereabouts. I put some music on and I walked to the beat. The road ascended and ascended as I reached Penybegwn (Hay Bluff) to my right. And my phone sprang back into life with numerous social media messages that put a smile on my rainy face. Then began the long descent into Hay itself. The Offa’s Dyke Path joined in from the Ridge but I continued on the road as the waymarks which should have lead me through fields into the town were not there. Quite suddenly, stabbing foot pain started, so I walked on carefully after taking painkillers. But then the familiar twang at the top of my left quadricep happened, again, and there I was hobbling down the hill at a snail’s pace. A car pulled up next to me. A friendly, concerned woman was at the wheel. And so I got in the car and she drove me the last quarter of a mile into Hay. I was overwhelmed by gratitude. After food, an enormous coffee and more painkillers, I limped to a pub to watch some of Euro 2016. Republic of Ireland versus Sweden, to be exact. I took my socks off (discreetly) and assessed the damage (also discreetly). Definite plantar fasciitis, but worse, my little toe was in a bad way and purple. So I cleaned it, dressed it and carried on watching the football. Looks like another rest day tomorrow. well done Siriol.keep it up! Enjoyed reading this! it’s lovely. I thought Llanthony was called Llanddewi Nant Honddu, but it’s Hodni then?